September 02, 1893: “THE GOLER MINING CAMP. 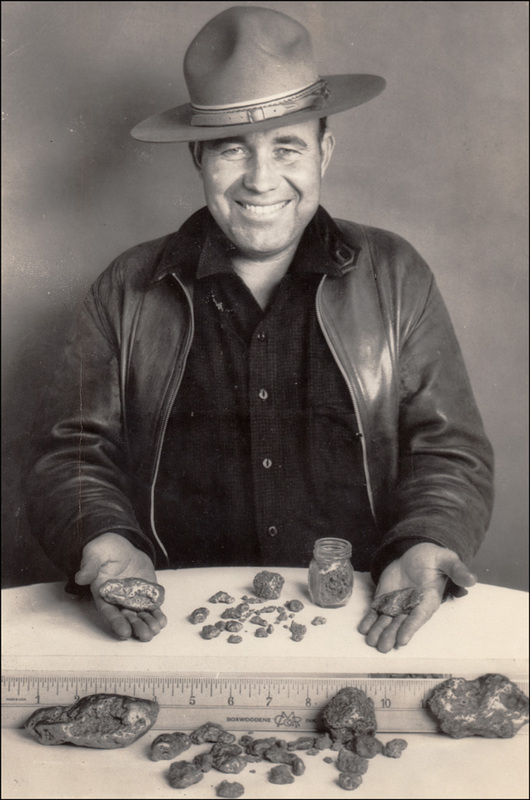 Mr. J. W. Abell, formerly a resident of Perris, but now a prospector of the new Goler Mining district, some thirty miles northeast of Mojave, brought with him a handsome assortment of nuggets from his camp. Mr. Abell says there are now about fifty miners in the camp engaged in placer and quartz mining. In the former about a dozen dry washers are at work. Little has been done during the summer, but now that the heat is less intense and the nights are cool, there is a good deal of activity in the camp and many claims are being worked. Besides gold quartz there is also rock containing silver and lead. Mr. Abell displayed a specimen which runs 47 in silver to the ton, and also contains forty-seven per cent, of lead. Mr. Abell returns to the camp today or tomorrow. January 01, 1894: “SOME MINES OF THE DESERT. – Big Deposits Which Are Difficult to Work. – Some Few Lucky Fellows Who Are Making Money. Possibly a Continuation of the Blue Lead—Trip to the Dlggings and Graphic Description of an Interesting Region. San Francisco Chronicle: For several months stray reports have been received at San Bernardino, Las Angeles, Bakersfield and other points of the discovery of rich placer mines in the northern portion of the Mojave desert, the locality of the mines being indiscriminately ascribed to Kern, Los Angeles and San Bernardino counties, whose boundaries meet in that wilderness. It is now known, however, that the mines in question are nearly, if not quite, all within the limits of Kern County. Recently these reports have become more numerous and more glittering, and some most extravagant statements have obtained currency with regard to them. Something very like an old-time rash commenced in consequence, which was amplified because of the large number of idle men who thought they saw in the mines a means of livelihood if not of fortune. So contradictory have been many of the rumors, and so difficult has it been to sift the residue of fact from the mass of rumor, that a representative of the Chronicle decided to investigate the matter personally and learn the truth in the case. Being an old miner and experienced in such matters, it was certain that he could hardly be imposed upon, and that what he reported as the result of his investigations might be accepted as undisputed fact. Preparations were made accordingly, and about two weeks ago be set out upon what under the most favorable circumstances is a most arduous journey, with little of comfort from commencement to finish. The nearest point to the mines is the station of Mojave, which is the junction of the Southern Pacific and the Atlantic and Pacific railroads, and is situated in the northern part of the desert from which it derives its name. Arrangements were made to have a light wagon and a mule team in readiness to meet the correspondent at that point, which was reached about 9 o’clock in the morning on the train leaving San Francisco at 5 o’clock the previous evening. A more unromantic and uninviting place than this same Mojave, by the way, would be difficult to find. Its chief characteristics are railroad tracks, hoboes, empty tin cans and wind. It is a favorite saying, and a quite truthful one, too, that the wind always blows at Mojave. Here the tides of tramp travel over the two transcontinental lines meet, and being a division headquarters many railroad men are obliged to live here. Obliged is the right word. No one was ever known to deliberately choose this as a place of residence, while the man who does not leave at the first opportunity is a rara avis indeed. Situated as it is in the midst of a desert, all the food of the inhabitants is brought from a distance, and consisting as it therefore does almost entirely of “canned truck,” it follows that in the course of the years during which Mojave bas had its windy existence, a vast accumulation of empty cans has resulted, and these are scattered over acres of land in every direction, where they lie, greatly to the wonderment of the traveler who if not posted with regard to the peculiarities of this remarkable place. But to resume the journey to the mines. Almost due north from Mojave may be seen on a clear day two notable mountain pinnacles, which, the inquirer will be told, are and have long been known as the Goler peaks. Running in a northeasterly direction toward the mountains from Mojave is a wagon road built years ago for the accommodation of teams hauling freight to and from the borax works in San Bernardino County, far to the eastward. This road skirts the foothills, and is for the most part as hard and smooth as a floor, with occasional short stretches of sand, which served to keep one in mind of the fact that this is a sure enough desert. At this time of year the weather is cool and bracing, and desert travel has little of the discomfort and none of the danger that characterizes it during the summer months. Our mules take us along at a good gait, and not many hours are required to cover the 20 miles from Mojave to the spot where the road forks, one branch—which is the stage road to Keeler, in Inyo county—bearing away in a still more northerly direction. Red Rock canyon is the nearest of the new mining districts to Mojave, and as this is our destination we take the left hand road the point of divergence being a railroad tie set upright in the ground. The Keeler road runs into Red Rock canyon soon after leaving the forks, and it is here that some really good mines are now being worked. This canyon is found to be a gigantic rift through the chain of mountains which bounds the desert on the north, and in no sense is a canyon as that word is generally understood. It would be called a mountain valley only it cuts right across a range instead of splitting one, or being subtended by two ranges on its sides instead of ends. But here it is, the ends of the great mountains respectfully withdrawn so as to make a wide and nearly level pass straight through, several miles in width and with any amount of elbow room. Once within the so called “ canyon” there may be seen some of the most splendid natural architectural effect upon earth. There is nothing its equal in symmetry, grace and beauty anywhere else to be seen on the desert. It is beyond description, but the day is coming when it will be widely known to men. And all of these wonderful scenic effects have been produced by the action of time on layers of different tinted sandstone, capped with other layers of volcanic mud. Two miles through the mountains and a gulch opens to the right. Up this a mile and a half and the dry placers are found. So far 300 locations have been made, generally 1500 feet by 500. Pillars of stones serving as monuments can be seen in every direction. At present there are 35 men in the camp, which is called Red Rock, and the following claims are being worked, named in the order as one goes up what is called the northeast fork of Red Rock canyon. : Davis & Joblin, opening their claim, bedrock deep and not yet reached; Forney, the same; Polley Heaps, taking out pay but making no report thereof; Farrell, prospecting; Shaw, Bell, Standard, Morse and Rendy, working six men altogether. Jackson A Campbell, said to be taking out good pay; Black & Sullivan, working for themselves and doing well; then one and one-half miles further up Holman & Nugent are taking out come gold. There are claims in this district worthy of note, and they differ in every characteristic save one. They agree in the fact that although called gravel mines, all of the rock is angular, and the sand. even to the finest, is none of it rounded or water-worn. Yet each claim is paying, and paying handsomely. When the rainy season comes, these side-hill deposits cannot, of course, be worked by dry washing, and anticipating that time they have sunk a shaft nearer the main gulch than their present surface workings. Three feet from the surface they struck “gravel” 3 feet thick. Then came 4 feet of “iron slime,” below which are 2 feet of pay dirt, which prospects much better than the upper layer. If water could be used upon the deposits covering these mountain than an immense amount of gold could be extracted, but as it is, by the expensive method of dry washing, only the bed and a little way up the sides of the gulches can be washed, and the great mass of this gold-bearing substance will have to be left untouched. Black and Sullivan discovered fine gold in this district in May last and have traversed the mountains from Maryland peak, near Tehachapi, to beyond Goler camp in a general course of north 18 degrees east, and have found fine gold in many places along a belt which may, perhaps, average three miles in width. Their theory of these deposits is that they have been gathered by some sort of water action like the wearing of the waves of tbe sea upon the auriferous mountain sides. They do not accept the theory of a stream of gold-bearing gravel having been brought down from Inyo County before the eruption of the tertiary times. Shaw, Bell & Co.’s claim was located on October 16, 1893, in what now is called Bonanza gulch, a narrow and irregular branch opening into the main gulch something like a mile below the sidehill deposits just mentioned. Here only the main bed of the gulch is being worked to an average width of about six feet. The deposit rarely exceeds 15 inches in depth, yet the output averages an ounce of gold to the man each day. The best days result was 15 ½ ounces, while the largest nugget found weighed 3 ¼ ounces. This product is the result from one dry washer. The ground being so rich no attention is paid to the sides of the gulch. Only the cream from the center is taken, and the results are indeed satisfactory to the owners. The time will before long come when part at least of this ground will be gone over. At the foot of the Bonanza gulch where its wash debouches into the main channel, a shaft 51 feet deep has been sunk, which shows seven different layers of gravel, and at the lowest of all is said to prospect from 30 to 60 cents to the pan. There were no boulders to contend with, and no water was encountered; but the owners are waiting until the rainy season to continue sinking and prospecting in the pay channel. Pretty much all of the area where prospecting has shown gold to exist, or where its presence is even suspected, has been staked off, and diligent search failed to show us, even if we had desired, an opportunity for making a location with any reasonable prospect of success. So, bidding farewell to Red Rock canyon, after a couple of days’ inspection, we struck out for Goler, soma 18 or 20 miles distant. The present discovery of coarse gold reads like a regular mining romance, and outlines with bold strokes those peculiar vagaries of chance which so coquettishly attend upon the discovery of the glittering gold. In December, 1892, Ramsey Cox of San Bernardino was on his way to Death Valley with a dry washer. A stiff desert breeze came up, and, to escape its penetrating chill, be turned out of the beaten way into Goler Gulch. Looking around with the natural instincts of a prospector, he espied some gravel. To see it was to try it, and from his first shovelful he panned out nuggets, of bright, coarse gold. Death Valley lost all of its charms for him, and his dry washer still gathers gold in Goler. From the mouth of Red Rock canon a drive of sixteen to eighteen miles, continuing in the same northeasterly course from Mojave, brings one to the mouth of Goler canon. Midway of the distance the level road for miles skirts a dry lake, whose surface is covered with a grayish white crust of crystalline effervescence, chiefly soda and salt. By the head of this lake, at a place called Desert Springs, is the headquarters of a cattle range where stock is driven from the Kern-river country for winter and spring feed on salt grass. As a general thing these ranges are over stocked, twenty to twenty-five acres of desert feed being none too much for one animal, so most of the poor creatures do penance for their daily lives by browsing upon greasewood, and a sorry-looking lot they are. Midway of the drive is the new post office of Koehn, established for the convenience of the Golerites by the side of a somewhat brackish spring, infinitely better than none, however. Charles Koehn is postmaster, storekeeper, boniface, mail carrier and very much of an accommodation in general. Goler gulch is like ordinary canyons and not a massive rift through the mountains like Red Rock. Little is doing in the main canon. Three or four miles up from the mouth there is a small stream of good water, and there three or four Mexicans are making small wages washing dirt with a rocker. The dry placers are in two gulches to the south of Goler canon, and are the last places on earth where an experienced prospector would have hunted for gold. There is nothing on the surface to indicate the existence of the precious metal. The low, smooth bills are all covered with debris of a recent formation, the earth is reddish, there is not a sign of gravel, and, besides an occasional water worn boulder, the rocks are small and angular, of a porphyritic, slaty or limestone nature. Yet by conservative estimates, $30,000 in gold has been taken out of the Benson and Read gulches during the past year. The Benson gulch comes first, as nearest to Mojave. Near its mouth Campbell and Kennedy, two experienced miners, have sunk a shaft 107 feet deep, reaching bedrock at that point. The wash matter, which shall here be called gravel, since everyone in the camp so terms it, prospects in gold from the surface to the bottom —not enough to pay by dry washing, but if water could be bad handsome returns would be realized. They are now drifting across the gulch in order to strike the pay channel, a thing which seems fairly within reach, for this channel, wherever found further up the gulch, has paid handsomely. They are miners and understand their business. Consequently, the work is done in good shape. The “gravel” stands in place well without timbering, and but one set of timbers has thus far been put in the shaft, which bas cost about $2 a foot to sink it to its present depth. The bedrock they have found looks like serpentine, and yet appears to be of a lime nature. Next comes the claim of Meacham & Yager, which is worked by an open cut 12 to 16 feet wide and nowhere deeper than 10 feet to bedrock. This claim is paying well. Willard’a claim follows. Here two dry washers are used, and the open cuts are about the same width and depth of the Meacham claim below, equally good results being obtained. Benson Brothers’ workings are next in order, and a like condition of affairs is to be seen. Some estimate that this claim has already yielded $12,000. Whatever the output, it is being vigorously and carefully worked. Reed’s gulch is the next north. Nearest its mouth is the claim of Johnson & Hagge, where a 30-foot shaft bas been sunk and the channel found. Six men are employed, and it is stated that the yield by drifting is about half an ounce of gold to the man per day. The Groves & Reed claim is next. Here the ground is worked by an open cut, 16 feet to bedrock at the lowest point to the gulch and about 12 feet in width. In going up the gulch the wash gradually becomes shallower. The owners are convinced that not enough attention has been paid to the bank diggings here as elsewhere, the only effort having been to find the lowest point in the bedrock and then work a few feet on each side. These diggings are yielding about half an ounce of gold per day to the man. Near the bead of this claim the 56 ½ ounce gold nugget was found which will be exhibited at the midwinter fair. The wash was about four feet deep and the nugget lay about four inches above bedrock, in a sort of bowl-shaped nest. W. C. N. Miller, who was working in the open cut, struck the nugget with his pick. It was so large that he could not be convinced that it was gold until he lifted it. When he turned it over to the owners, “one of them,” as Miller said, “jumped as high as my shoulder.” But Mr. Miller is not a very tall man. Right beside where this nugget lay 12 1/2 ounces more of gold were taken out. Benson brothers own a claim a little higher up, on the right fork from this gulch, which is said to be the richest one in the camp. Above Goler, high up in the mountains, is a very steep gulch, 3750 feet long, owned by McAfee, Moore, Shropshire and Groves. It is not worked over 6 feet in width, and the bedrock is from 1 to 4 feet below the surface. Here were recently found two nuggets, one weighing about three and a half ounces, and the other eight and a half ounces. There was not over a foot of wash covering them. The Red Rock claims are upon the western and the Goler upon the eastern slope of the same mountain chain, and have little resemblance to each other. The foothills in the Goler district are covered with wash, and it is stated that all of it prospects a little in gold—enough, if water could be obtained, to make a magnificent hydraulic gold field. The gulches, so far as prospected, have channels that pay handsomely. But there is no room now here for prospectors. The whole country for miles around is covered with location notices. Corner and center monuments and the like are as plenty as greasewood bushes, or almost so. Everyone who has been upon the ground, after recording for himself, seems to have built a lot of monuments in memory of his wife’s relations, and in this wise the whole country has been “gobbled up.” Most of the locations from a local standpoint, are valueless, but a prospector who comes along willing to put bard, honest work upon a claim is not going to prospect where someone else has posted a location notice. Why should he? If he strike it rich someone will show up and try to claim it or seek to be bought off, and if he finds that the claim is worthless be baa proved that fact at his expense for the benefit of another man. There would be a splendid show for many an idle miner to make $1 a day and upward, with the chance ever before him of striking it rich, if this wholesale location in job lots had not been practiced. But these districts can never have much popularity, for the reason that the entire supply of water in the country, good, brackish and bad, is sufficient for only comparatively few. Eighteen miles beyond Goler, in the same northeasterly course, a new discovery has been made by the Van Slaicks. A rush bas been made to it, and numerous square miles of desert arc breeding stone pyramids, but thus far the Van Slaick gulch is the only one that has produced any gold. The gulch is short, but the gold is fairly coarse. A mysterious district has also just been located. The chief mystery it where gold can be found, for no one has seen or heard of any yet. Nevertheless, location notices are out announcing the marriage of Lead to Cupidity, and are posted in stone monuments as usual. The mode of location has the merits of ease and illegality to a marked degree. Take a paper, ten to one written on the back of an old envelope, from its last resting place, the stone pyramid, and you will read: “I, Joe Doe, have this day located 1500 feet by 600, running 75 feet each way from this notice in a northeasterly direction, commencing with the northeast end of the claim located by John Don, to be known as the Dan Pan.” John Doe takes John Don’s corner monuments for his own, steps out 750 feet northeasterly by a sort of mental guesswork, which makes it a thousand feet at least, and puts up a center monument, within which his notice is inserted. Then he goes north east until he is tired, calls it 750 feet, guesses about how far each way 300 feet would be, builds a monument at each corner, then turns his back upon the whole enterprise, and the chances are one to ten thousand that he will ever see his claim again unless someone develops gold for him. But then this is on the desert, where men and water are scarce. Hence the tediousness of legal red tape is a thing to be lost sight of, for no lawyer would ever venture upon the desert for fear the devil might get his own. So the poor prospector, “who takes his life in his hands and goes forth,” hurries to take his life back again and go out, leaving his claim of title builded in stone behind him. A new deposit of coarse, gold-bearing gravel has recently been discovered about 20 miles northeast of Goler. At a miners’ meeting held Tuesday it was ordered that only one claim could be located by any one man, and that no man should locate a friend’s unless such friend himself was in the district. This course has been taken to meet a complaint which has been strongly heard from the other three camps, to the effect that one or more men have located as many as 40 claims in one district, thus shutting out all others. Mining law recognizes clearly the first in say, for it is positively set forth that “the first on record shall hold.” It seems hardly fair that one man should take up a whole district, yet again it is not just that a man who has taken his life in his hands and has gone out alone into a desert should not be allowed any reasonable latitude for remembering his friends and those whom he knows, if, by fortunate chance, he should discover that dream of men’s dreams, pure virgin gold. To allow one man all of a district is too liberal, but to give him only one chance at the fortune that he has discovered does not seem right. There should be a medium that is happier than either of the present ways. The only places where gold has been thus far found lie upon one side or the other of a mountain range which has a general course a little east of north, and is a portion of the Sierra Nevada chain. Upon its summits there are traces of an ancient river bed, and there is no doubt but that at some prehistoric time before the tertiary period, a stream, such as would be produced by the union of the Owens and Kern rivers, had its channel where now is the upheaval which has made the present Goler mountain chain. Associated with this mountain, as a parallel is a series of distinctively volcanic ridges, which give evidence of a period of intense heat. It is a plausible theory that the heat of those volcanic days aggregated the gold in the ancient river bed, and that since then cloud bursts and the erosions of time have washed the precious nuggets down the mountain sides and partially concentrated them in the gulches where they are now found. Every particle of gold gives signs of having been melted, as it undoubtedly was in the days of upheaval and chaos in the desert. Red Rock, Colorado and El Paso camps are upon the western side of this old river chain, while Goler, Summit and Camp Mystery lie upon the eastern slope. The idea has been advanced that this old river bed is the same dead channel which is found along the Sierra as far as the Oregon line and is usually known as the Blue lead, and that idea is not without merit. From Mojave to the different camps, in each case by a good wagon road, the distances are as follows: Red Rock, 26 miles; Goler, about 40 miles; Summit, 55 miles. El Paso is about 12 miles from Coyote Holes, or Freeman Post Office, a station 50 miles from Mojave. Where the miners live are all “dry camps;” that is, there is no water, and that necessity of life has to be hauled in barrels to the prospectors’ home. Hay and grain and, of course, everything that man needs for his sustenance, has to be brought from Mojave, and there are already freighting teams sufficient for present needs. The distances from the different camps to good water range about as follows: Red Rock, three miles; Reed and Benson gulches, in Goler district, fire miles, over a miserable road, which no one seems to have time to fix; Summit,12 miles; El Paso, eight miles; Colorado camp, four miles. Everyone lives in tents and blankets for sleeping purposes are spread on the hard ground. For food, flour and bacon are the staples, with vegetables in abundance. So far as living goes there is both comfort and abundance in every camp. Sunday is washday, when the boys loaf, sew on buttons and pray for Monday to come. It is a fact, remarkable enough, that no liquor is sold in any of these camps. Without the invention and perfection of the dry washer nothing could be done at any of these desert camps. The method is yet in its infancy and before very long the same system of dry washing will be in extensive use during the summer time in places where there is an abundance of water. There are several kinds of machines, costing from $50 upwards, and each has its stout friends and equally pugnacious enemies. But the principal is alike in all. Men with a little ingenuity make their own machines at a cost of only a few dollars, and these seem to be just as effective as any. The machine has, first of all, a quarter-inch mesh, set at an angle of about 35 degrees. Upon this all of the dirt is shoveled. The fine stuff that falls through this screen goes into a hopper which has at the bottom a little door, fixed with a trip handle, and so arranged that it can be set to open more or less as desired at each blast of the bellows. Upon leaving the hopper the fine stuff falls upon a brass screen of 80 to 100 mesh to the inch, underneath which is tightly stretched fine muslin. This screen table is set at an angle varying from 20 to 30 degrees, and has transversely across it rifles which project about one-half an inch high. Beneath all of this is a pair of bellows. The gusts or jets of air produced by the bellows action keep the loose stuff that is on the wire screen in constant motion. Gradually the line and worthless stuff blows away or washes over the riffles to the spout. Alter 15 shovelfuls of dirt have been fed into the machine and winnowed the screen table is taken oat and its contents carefully emptied. At the close of the day these concentrates are carefully panned in water, just as would be done in any placer camp. A careful review of the entire region thus far worked leads one to the opinion that there is a great area of gold-bearing drift capable of yielding fair wages to careful workmen for many years to come. There seems to be no reason why many gulch claims will not yet be found that will yield as well as those at presently being worked, and there are large deposits of drift which can be made to pay $2 to $3 a day to the man when the present thirst for rich diggings chokes itself out. The present mining is too hastily done. In the open cuts the only thought seems to be to find the lowest place in the bedrock and work a few feet on each side, no attention being paid to bank digging and to prospecting for side stringers and chispas, as should be done. The day will come when much of the present ground will be worked over, and if done with patience and skill good wages will result. There is a great amount of ground that will yield very little only the scantiest kind of pay by dry washing, and appreciating that fact the miners of the Goler district have already set their hearts on having water brought in from Owens River, some 90 miles distant. To this end the whole country has been recorded, and the locators have formed the Goler Consolidated Company, with claims aggregating 4000 acres, in area. The promoters of the Inyo canal are said to look with favor on the enterprise. With water brought on this would make a magnificent hydraulic field, but to do this is a matter of a great deal of time and a large sum of money. January 20, 1894: “NEWS HAS BEEN RECEIVED that on Saturday last Campbell and Kennedy, the two miners who sunk a shaft near the mouth of Benson gulch, in Goler mining district, 107 feet deep before reaching bedrock, struck the pay channel. They found coarse gold in quantities that will pay handsomely and are reported to have taken out $100 the first day. The singular thing about it is that, unlike any other gold thus far found in this last strike, the gold is in quartz, or rather, quartz is associated with the gold, and this is the first evidence of quartz in the whole district. It is quite evident that the possibilities of that region are not yet within comprehension. The storm which had been so general throughout the state has raged with great force on the desert and most of the prospectors are striking out for warmer quarters, all of them, of course, intending to return in the spring.” --Mohave County Miner. February 05, 1894: “AT GOLER. Among other parties working at tbe Goler camp are the Benson brothers of San Bernardino. This party consists of three, all young men. They went to Goler a few months ago, located claims and began work. A gentleman who is in a position to get the facts says these brothers have already taken out not less than $120,000. Recently richer ground than any before opened has been found. Gulches in the hillsides have been prospected and found very rich. March 31, 1895: “All the old-timers remember John Goler, who kept a blacksmith shop and a carriage warehouse in a long adobe building that boasted a second story over only half of it, and that occupied the site oh the west side of Los Angeles street two doors south of Commercial, now occupied by the Ilayden & Lewis Co., the harness and leather dealers. John Goler won most of his fame from his exploits in Death Valley. The Largest Nugget Found At Goler In 1932 Weighed One And A Quarter Pounds and Was Valued at $403, When Gold Was $36 An Ounce. This entry was posted in Garlock, Goler Mines. Bookmark the permalink.